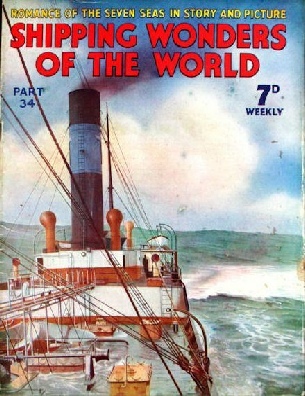 Part 34 of Shipping Wonders of the World was published on Tuesday 29th September 1936. It included a centre photogravure supplement featuring sailing ships and tugs, which formed part of an article with the same title. This week’s cover is based on a photograph taken in 1913, and shows the oil tanker F A Tamplin (4,004 tons gross) in a following sea. I am informed that the Chief Steward of the F A Tamplin cured the photographer - then a cabin boy - of sea-sickness one day. He forced the boy to eat every meal and forced him to work hard all one Sunday, when he was in the throes o his malady. By the Monday morning all was well. Concluding section of this article from part 33. The vessel shown above is the Klipparen, which was completed by the Swedish shipbuilding firm of Götaverken, at Gothenburg, in July 1935. The Transatlantic Steamship Company of Gothenburg owns some of the fastest medium-sized vessels trading between Gothenburg and South and East African ports. These ships carry general cargo outwards and homewards, and in addition on the homeward voyage a great deal of fruit. For this purpose No 2 Lower Hold is refrigerated throughout. The Klipparen has a deadweight tonnage of 5,970, a length of 379 ft 4 in, a beam of 50 ft 1 in and a depth of 20 ft 3 in. In service her speed is about 15 knots when loaded down to 23 ft 5½ in. 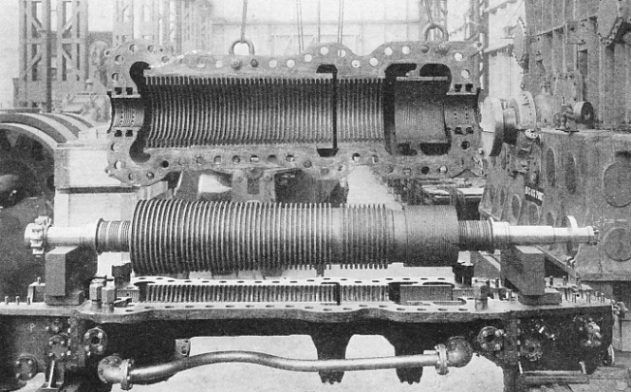 Propulsion is by two diesel engines, with eight cylinders of 21.69 in diameter and 39.37 in stroke. These engines deliver to the two shafts a total of 4,080 horse-power at 175 revolutions a minute. The vessel has two complete decks fore and aft. Slightly abaft midships is a structure streamlined at the forward end. 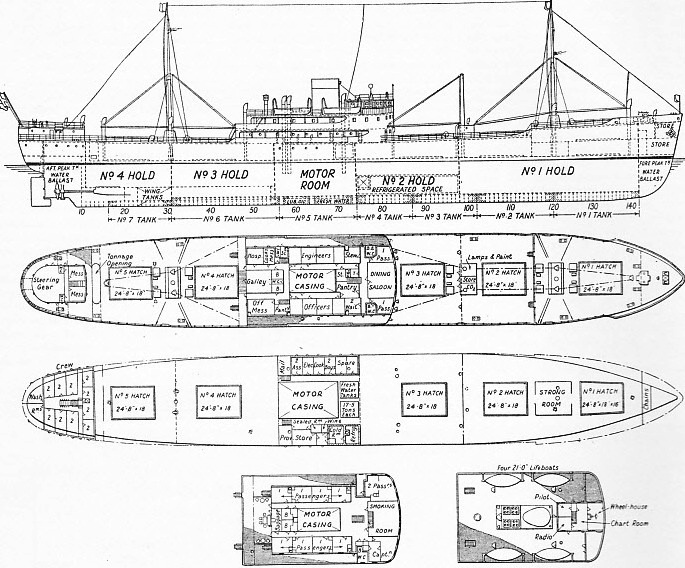 This contains accommodation for deck and engineer officers on either side of the motor casing at shelter deck level, and a dining saloon and two passenger cabins at the forward end. Above this is a further arrangement of passenger cabins, with a smoking-room at the forward end. There is a long forecastle of what is known as sunken type - the forecastle floor is slightly below the level of the shelter deck. The four holds are served by five hatches. The vessel has a raking stem and a spoon stern. She has a strong appearance, which is improved by the curved superstructure, the streamlined funnel and the two pole masts, with derrick posts alongside in either instance. This is the twenty-sixth article in the series on Merchant Ship Types. A survey of life at sea in British ships from the close of the Middle Ages to the accession of Queen Victoria. During this period seamanship gradually improved and the men-of-war and merchant ships built up British sea-power and sea-borne trade. This chapter is by Lieut.-Com. E. Keble Chatterton. It continues the story At Sea in the Middle Ages which appeared in part 24. TOWED FROM ENGLAND TO THE STRAITS, a distance of 8,500 miles. The floating dock for the Naval Base at Singapore was built at Wallsend-on-Tyne and towed to its destination through the Suez Canal. 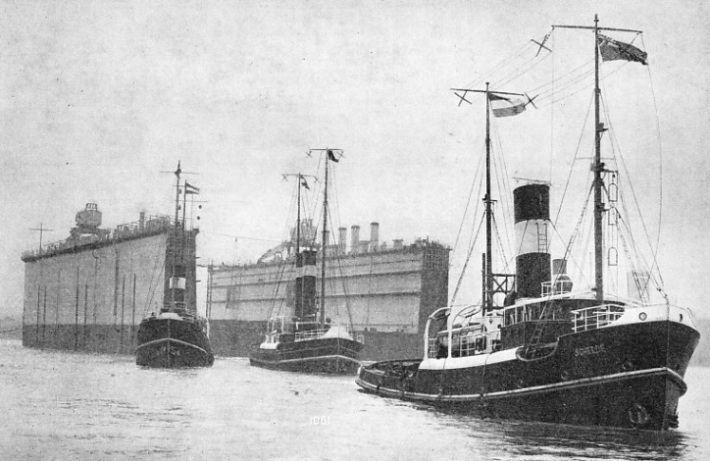 Four tugs towed the middle section and four the end sections. The dock, the third largest floating dock in the world, is 857 feet long and 126 feet wide. It has a depth of 40 feet on the sill, with a lifting capacity of 50,000 tons. PAST THE TAIL OF THE BANK in the River Clyde, near Greenock, the old paddle tug Flying Huntress tows the Ellen out to sea. 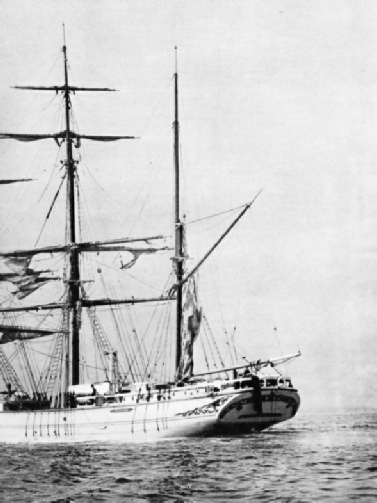 The Ellen, 513 tons gross, was built at Grimstad, Norway, in 1893. Her length was 146 ft 8 in, her beam 31 ft 6 in and her depth 14 ft 9 in. The Flying Huntress was an iron vessel with twin funnels, typical of many of her contemporaries. Built at South Shields in 1878, she belonged to the Clyde Shipping Co. As with most tugs, her net tonnage of 40 was considerably smaller than her gross tonnage, which was 177. In a modern tug the net tonnage would probably be nil. She had a length of 122 ft 6 in, a beam of 20 ft 2 in and a depth of 10 ft 7 in. The Suez Canal and the Panama Canal may be regarded as the most important artificial waterways on the earth’s surface. But they are not the only canals of importance. Not content with turning extensive peninsulas into islands, man has had the audacity to make short cuts across whole countries, and even to turn inland cities into seaports. A notable example of an inland seaport is Manchester, connected by the Manchester Ship Canal to the estuary of the Mersey and the Irish Sea. Of the short cuts across countries, we have in the Caledonian Canal an example in our won country. But the longest of these - incidentally one of the longest canals in the world - is the Göta Canal. The natural waterways of Sweden have been linked by the Trollhätte, Göta and Södertälje (Södertälje) Canals to form a route across the country from the port of Gothenburg, on the Kattegat, to Stockholm, the capital of Sweden. Of the total distance of 347 miles about one-third consists of artificial canals. 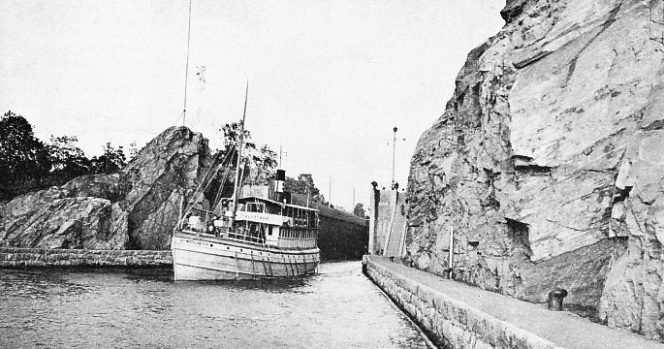 This chapter is by Sidney Howard and is the eleventh article in the series on World Waterways. BLASTED FROM VIRGIN ROCK the locks at Trollhättan (“Witch’s Cap”) are unsurpassed on the system for grandeur. The locks were built to avoid the falls of the River Gota. Vessels up to 285 ft 5 in long and 41 feet in beam can use these locks. The Motalaström, a vessel of 266 tons gross, belongs to the Göta Canal Company. She has a length of 96 ft 6in, a beam of 27 feet and a depth of 8 ft 9 in. The modern marine steam turbine has been developed from the two main principles, reaction type and impulse type, invented respectively by Hero of Alexandria about AD 50 and by Giovanni Branca in 1629. This chapter is by F E Dean. SHORT ROPE FOR RIVER WORK. Taken from the stern of a tug, this photograph shows the short tow rope used for bringing the Oaklands up the River Thames. A barque of 1,003 tons gross, the Oaklands was built at Dundee in 1876. She had a length of 200 ft 9 in, a beam of 34 ft 1 in and a depth of 19 ft 5in. SHEPHERDED TO HER BERTH by the tug Terrier at Chatham. 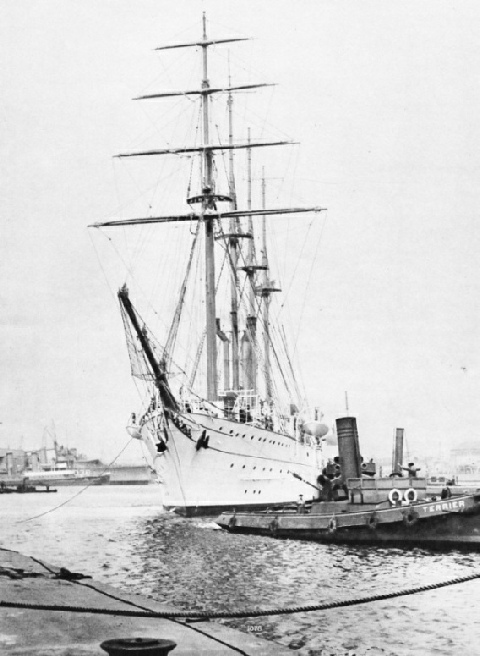 The new Brazilian training ship Almirante Saldanha spent several weeks at Chatham in 1936. Built by Vickers-Armstrongs in 1933, she has a displacement of 3,325 tons. She is a four-masted barquentine, with a length of 305 feet, and is fitted with a six-cylinder diesel engine of 1,400 horse-power. Captain Voss experienced on his remarkable voyage. This chapter is by Sidney Howard and is the seventh article in the series Great Voyages in Little Ships. It is concluded in part 35. 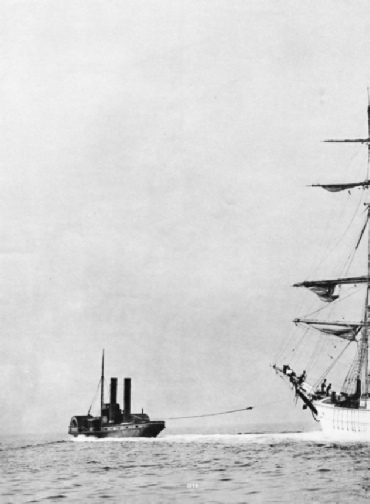 You can read more about Voss’s adventures in The Venturesome Voyages of Captain Voss, first published in 1913. ORIGINALLY A RED INDIAN DUG-OUT, the Tilikum was bought by Voss and made suitable for an ocean crossing. Her length on the keel was 30 feet and her greatest beam was 5 ft 6 in. 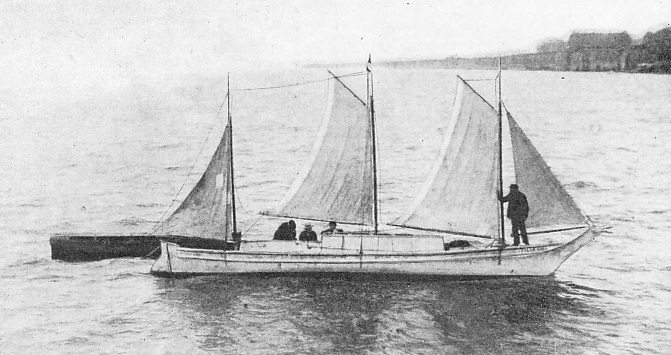 Voss built a cockpit and a cabin 8 feet long, fitted lead on the keel and rigged the canoe with three masts, carrying a total sail area of 230 square feet. The Tilikum drew only 2 feet of water. 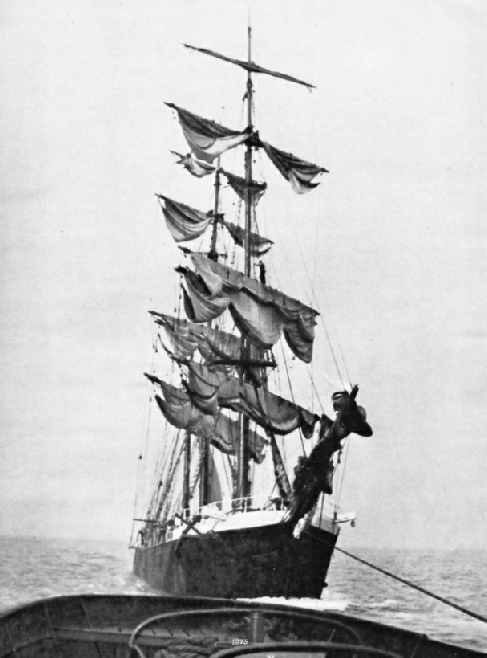 This photograph shows her sailing into Margate, Kent, on September 14, 1904, after having sailed across the Pacific, Indian and Atlantic Oceans. A SECTIONAL DRAWING, or, as the draughtsman notes, ‘The perspective appearance of a ship’s body in the mid-ships dissected’. 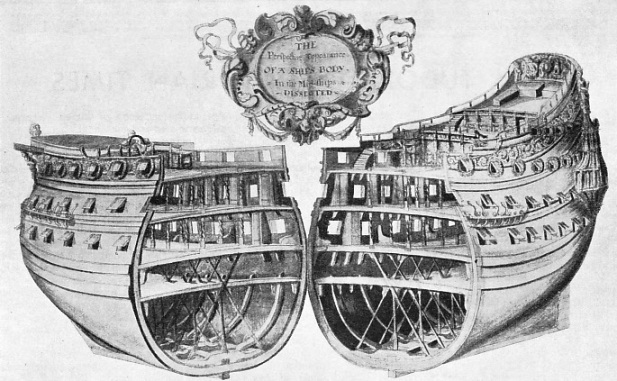 The drawing shows in considerable detail the interior arrangements of a man-of-war at the end of the seventeenth century. The use of cross-struts in the hold was adopted in the construction of most ships of that period. WAITING FOR THE TIDE in Belfast Docks. The barque Wenona is to be towed out to sea by the paddle tugs Ranger (alongside) and Protector (astern). The Wenona, 530 tons gross, was 148 ft 11 in long, with a beam of 34 ft 6 in and a depth of 13 ft 2 in. 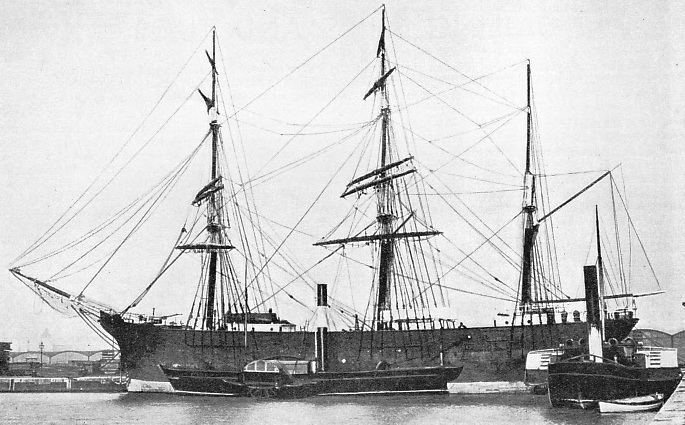 She was built at Canning, Nova Scotia, in 1882. The old paddle tug Protector, 89 tons gross, was built in 1869.